The Edifier S2000 Pro joins a long line of excellent speakers reviewed on this site. 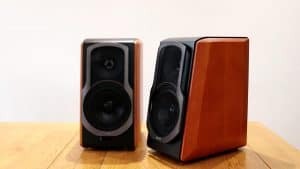 Edifier are well known for their great speakers at a reasonable price, so what happens when you up your budget and go for their higher end equipment? Although billed as bookcase speakers the S2000 Pro are considerably bigger than Edifers other offerings, such as the Edifier R1280DB. If you’re planning to pop theseon a desk or TV stand be sure to check the measurements and weight capacity. At least you don’t need to worry about them being too far apart, you get a 5 meter cable to connect them together which should be more than long enough for most peoples needs. You’ve an array of options in terms of connections, they’re all located on the back of the active speaker and you can also connect via Bluetooth. Sadly Edifier is yet to embrace a WiFi connection, something becoming more common at a lower price thanks to the likes of Amazon’s Alexa and Google’s speakers, however you could always add an AudioCast to give the S2000 some streaming smarts. Where the Edifier S2000 Pro’s massively outstrip the smart speakers is in sound quality, they offer a very full sound, with clean vocals and a good bass. They’ve little problem filling the room with your chosen sound source and are as good at movies and games as they are at pumping out your favourite songs. If you currently don’t have a sound bar or are using your laptops inbuilt speakers you’ll find these to be amazing, like you’re hearing sound properly for the first time. In the review video below you’ll see a comparison to a laptop. What may not come across very well is just how much nicer the Edifier S2000 were, at high volume the laptop speakers were painful to listen to, like stepping into a cold shower, whereas the Edifier S2000s provided a comfortingly warm audio bubble for my ears to relax in. The speakers can be controlled remotely via the included remote, a much nicer remote than you get with the lower cost Edifier speakers. This allows you to control volume, inputs (you can see which input is selected via a small display on the speakers), and skip tracks if using a compatible device. You’ve got manual controls on the back of the active speaker to control volume, treble and bass, giving you the ability to fine tune the sound to your liking. The S2000 give you a big sound witihout any distortion at high volume, they’re suitable for a range of uses and they sound fantastic.